Image caption Giles Corbin said there was now "an excellent chance" he would be able to keep his injured left leg after earlier fears it would have to be amputated. A man who suffered "catastrophic" injuries in a crash between a jet ski and a speedboat hopes to walk again. 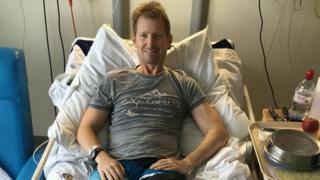 Giles Corbin was told there was a 90 percent chance his leg would have to be amputated following the accident in St Brelade's Bay, Jersey, on 9 July. The 45-year-old, who was a passenger on the jet ski, has now been told by doctors he has an "excellent chance" of retaining his leg and walking again. The speedboat driver, 36, was arrested on suspicion of driving recklessly. He has been bailed and the investigation is ongoing. Mr Corbin had been told his injuries were "catastrophic, life-changing", but is now on crutches after a 12-hour operation to reconstruct muscles and ligaments around his left knee. He said the extent of the damage was immediately clear when he pulled himself out of the water. "I could see my femur completely exposed, with a slash of about something like 15 inches up my left thigh, then a cut going down to my ankle with my calf hanging out." Mr Corbin said he stayed "absolutely calm" to ensure fear did not raise his heart rate and increase blood loss. He thanked the driver of a nearby boat who pulled him out of the water and took him to shore. "A huge thanks to Geoffrey Blackstone, his wife and kids, who were absolutely brilliant", he said. Mr Blackstone described him as "remarkably calm, and incredibly brave."